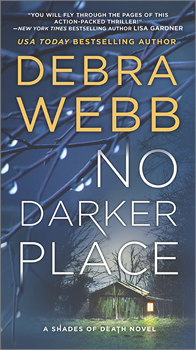 I was excited to be able to interview Debra Webb for her new novel NO DARKER PLACE. 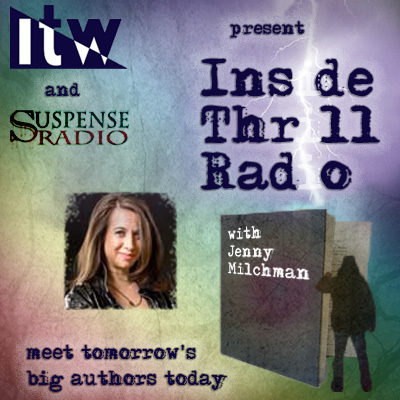 We both write suspense for Mira Books, and I am impressed with her own backstory which is one of courage and tenacity. “Never give up” shouts from her heroine’s lives—and her own. 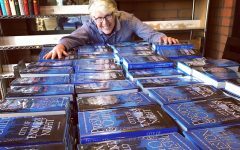 This month, she took time out of her schedule to chat with The Big Thrill about her new release, winning awards, the pros and cons of writing series characters, and her sage advice for aspiring scribes. Please tell us what NO DARKER PLACE is about. Detective Bobbie Gentry has one objective: to stop the serial killer who robbed her of her husband, her child, and her life. Nick Shade understands Bobbie’s pain—and her desire for vengeance. He’s on a mission of his own, and the murderer known as the Storyteller is next on his list. Nick knows that the best way to find his target is to stick close to Bobbie. But as she becomes more and more reckless in her attempts to lure the Storyteller out of hiding, he has to make a choice: will he protect her from herself even if it means passing up the chance to take out one more monster? As for Bobbie, she’s forced to decide just how much she can trust this stranger who knows so much about her. And both of them are about to learn whether or not two broken people can save each other. I love your ‘dark’ titles which really cue the reader in on danger/thriller. NO DARKER PLACE and The Blackest Crimson are very evocative. Where do you see yourself on the noir or not-so-noir spectrum? The Shades of Death series is the darkest work I’ve done. Though the stories are very dark suspense wise, they also represent some of the deepest emotion I’ve been able to capture on the page. I’m very proud of the series. 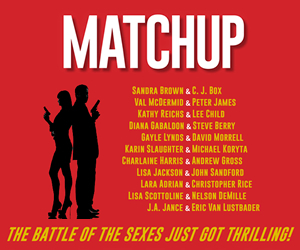 I have recently found that writing a thriller series is a new challenge over writing single title books. Has that been your experience? Which do you find easier? Can you share any tips about writing a series? A series can be challenging simply due to the sheer number of details related to the characters, the setting, the subplots of each story as well as the overall plot of the series. I keep a lot of notes but the best thing I did was start a bible of sorts about the series that contains everything about the characters, the setting, the plot, etc., and any research I’ve used. I think it’s a tremendous tool. Additionally, I hired my own proofreader/preliminary editor to read and ensure I don’t drop a thread or give someone blue eyes who previously had brown eyes. The Blackest Crimson is a prequel to your Shades of Death Series which has NO DARKER PLACE for its launch book. Did you originally intend the prequel to be that or was it going to be a standalone, but you fell in love with the characters or premise? Or is Shades intended to be mostly a promotion piece for this dynamic new series with your first book coming in hardcover? As I wrote NO DARKER PLACE, I realized it was imperative to give readers an insight into what Bobbie had survived. It wasn’t enough to just give a few details in backstory. Her story of survival was an incredible journey for her and for me. I cried while writing it and again when I reread it in galley form. I went to the darkest place I could find in my soul to write that short story, hence the title NO DARKER PLACE. The plan is to move into hardcover with the fourth book. I am immensely excited about my partnership with MIRA! I’m hoping to build a base of characters that readers will love with the first three books: NO DARKER PLACE, A Deeper Grave, and The Coldest Fear. Your excellent website mentions you were a born writer from an early age and now have more than 100 novels in print. How has your writing style or subject matter changed over time? It’s true! I began telling stories as a child. Primarily, I think, because my grandmother was such an amazing storyteller. She always told me these spooky, mystery stories. Many years later when I decided to go for publication, I did my research and felt that romantic suspense was where I needed to begin. I even did a few lighter romantic comedies. That was the business side of me looking at what was selling at the time. But from the beginning my instinct was to go darker. Finally, eighteen years and about 130 books later, here I am! Don’t get me wrong, I love romantic suspense and I will continue those with Harlequin Intrigue and my amazing editor Denise Zaza for as long as they will let me. You received several awards, but the most intriguing and unique is the L.A. Banks Warrior Woman Award for courage, strength and grace in the face of adversity. Can you explain more about this award and how that part of your background has impacted your heroine or your stories? Well, it’s a long and painful story so I’ll try to keep it short. In 2010 I was injured and lost the use of my right arm and hand. It was devastating, particularly since I was right-handed. It was a horrifying injury that required years of hard work and tremendous support from friends and family to recover most of the use of my right arm. My hand, though, will never fully recover. In the beginning I was convinced my writing career was over. My friends rallied around me and bought me the most advanced version of Dragon available. I couldn’t make it work. I had been telling my stories from my brain to my fingers since I was nine years old (first via pencil and then the wonderful old typewriter my mother bought me at a tag sale and eventually a computer). My friends and family and readers were so encouraging how could I possibly give up? I had to keep writing. I’ll never be able to do all that I once did, but I manage. I was honored to be the first recipient of the award. L.A. Banks was a great lady, a talented author and inspiration to anyone who had the privilege of meeting her. I’ve had so many strong women in my life—my mother and sister and so many dear friends, but the strongest of all is my older daughter, Erica. She was born with incredible physical challenges and she has never, ever allowed anything to hold her back. How could I not write strong women? You have a unique pre-writing career background. 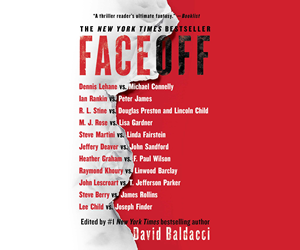 Not many female authors have worked for the Commanding General of the U.S. Army in Berlin or had a five-year stint in the NASA shuttle program! How did you get such a fascinating resume and do your previous “adventures” show up in your novels? I guess I was born determined. I grew up on a farm in small town Alabama and we were poor. College wasn’t an option until much later but I was determined to go for the best jobs available, even if I didn’t have the needed experience or any higher education. I was fortunate that my sheer determination was enough for some employers. But I started out working behind a soda fountain. I’ve worked at an elastic factory, sold vacuum cleaners, cleaned hospital rooms, and been the assistant manager at a number of fast food restaurants—all before college. But my very first work experience goes back to when I was six years old and already working for a dollar a day as a babysitter. They say I was born a grown-up too. I suppose it’s true. You have a research assistant—don’t I wish! Can you explain how that came about and how the two of you work together? My younger daughter, Melissa, is a stay at home mom. Once a week she comes over and does whatever I need done (filing, etc) and I get to play with the baby! My older daughter, Erica, and her husband help out from time to time as well. An afternoon with the grandkids is a great way to relax! But for the real research, my husband is my man. He is a man of many talents. Can you give other authors any advice about balancing the demands of publishing/ publicity today with ‘real life’? Take some time for yourself and your family. You never know what tomorrow will bring. Treat your writing like any other “job.” Set hours that you are unavailable for visits and phone calls from friends. Make the office a real office—this is where you go to work. Make sure friends and family respect your work hours. Just because you’re working at home doesn’t mean you’re available for tea or a lengthy phone conversation just any time. And always read. As writers sometimes we get so caught up in work we don’t take time to read. Reading is important. A good friend and fabulous writer, Stephanie Bond, once said that reading helps a writer stay in the rhythm of writing. I believe her point is a valid one. Just like music makes our bodies want to move, reading a good book makes our fingers itch to find the keyboard and create one of our own! 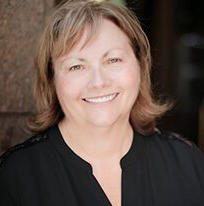 Debra Webb is the award winning, USA Today bestselling author of more than 125 novels, including reader favorites the Faces of Evil, the Colby Agency, and the Shades of Death series. With more than four million books sold in numerous languages and countries, Debra’s love of storytelling goes back to her childhood on a farm in Alabama.